Imagine a world without TV and video games. A world before LEGO, or Frisbees, or Barbie. Meet the amazing men, women, and kids who changed the way we have fun. Who knows? Someday, you could be one of them! Part of the Problem Solved! Your Turn to Think Big series, Innovations in Entertainment will inspire readers to try their hands at inventing a new way to play. For grades 3-6. Before anesthetics, people had surgery while awake. Before antibiotics, an infected scratch could kill you. And before insulin, the only way to treat Type I diabetes was starvation. But thanks to hard working doctors, scientists, inventors and engineers, modern medicine has come a long, long way. 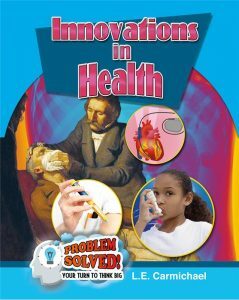 Also for grades 3-6, Innovations in Health encourages young readers to think about how they could make today’s world a healthier place. 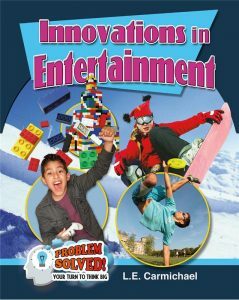 A lot of the inventions and innovations in Entertainment were developed by kids and teens – including television. Learning about these inspiring young people made me feel like a serious underachiever! Did you know Monopoly was invented by a woman? Neither did I, until I started working on this book! Charles Darrow stole the idea from Lizzie Magie, and Parker Brothers bought her patent for a mere $500. When researching the anesthesia spread for Health, I came across a famous surgeon who used to yell “Time me, boys!” before amputating patient’s limbs. His fastest time for removing a crushed leg was 28 seconds. Did you know that the man who invented portable pacemakers was inspired by the movie Frankenstein? It’s true! Check out the heart science spread of Innovations in Health for more. I only had room to cover 11 inventions in each book, and picking was a serious challenge. So many cool things to cover, so few pages to put them into! I hope these books will inspire young readers to learn more.